What Are the Types of Castleman Disease? What Are the Symptoms? Castleman disease is a disease of the lymph nodes -- groups of bean-shaped glands throughout your body that help you fight infections. It makes the cells in and around those nodes grow too much and too fast. Though Castleman disease causes an overgrowth of cells, it is not cancer. But having Castleman’s disease can increase your risk of lymphoma, a cancer of the lymph system. Castleman disease is rare. About 1 in 6,500 Americans has it. People of all ages can get it, but it’s more common in adults. Infection by certain viruses, like HIV, seems to make you more likely to get Castleman disease, but about half of cases have no clear cause. Castleman disease is also called giant lymph node hyperplasia and angiofollicular lymph node hyperplasia (AFH). It’s named for the doctor who first described it in the 1950s, Benjamin Castleman. There are two main types of Castleman disease: localized or unicentric, and multicentric. They affect people in different ways. Localized Castleman disease is more common among 20- to 30-year-olds. It affects a single lymph node or a single region of lymph nodes, usually in the chest or belly. It makes them grow larger than normal. If it’s in your neck, groin, or underarm, you may first notice a lump under your skin. In your chest, these oversized lymph nodes can press against your windpipe or airways into your lungs, which can make it hard to breathe. In your belly, they might cause pain, make you feel full, or make it hard to eat. And some people with localized Castleman disease have no symptoms at all. 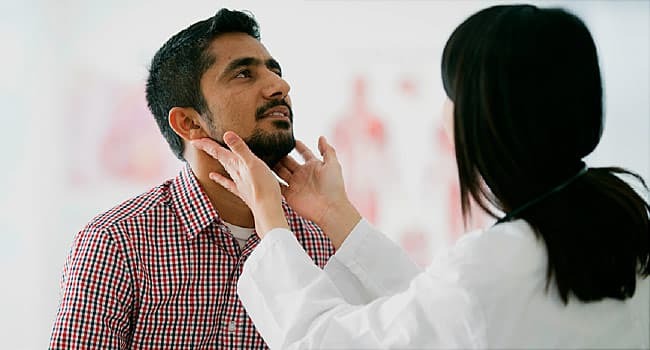 Doctors can usually cure localized Castleman disease by removing the affected lymph nodes with surgery. Multicentric Castleman disease (MCD) is the more serious and more complex type. It affects more than one group of lymph nodes and can also affect other parts of the lymph system. It’s most common in 40- to 60-year-olds. There are two main types of MCD. One is related to a virus called human herpes virus-8. You might be more likely to get HHV-8 if you have HIV or take medications that turn down your immune system. Doctors don’t know what causes the other type of MCD, but they call it HHV-8-negative MCD. Anemia -- having too few red blood cells -- is very common if you have MCD. It can give you shortness of breath and fatigue. You might also have a buildup of abnormal proteins in your body. This can damage your heart, kidneys, and nerves, and also cause diarrhea or other digestive problems. Because MCD makes your immune system weaker, you’re more likely to get a serious infection. Since MCD affects many areas of your body at once, surgery usually isn’t a good treatment choice. But there are other ways to treat the disease and control your symptoms.